A couple more 185mm beauties!!!!! He is the my newest Codseeker. Alot wider at the front with the tail getting skinner. Nice collection. They would fill up the lure display quick. Not sure how many colours come out. But I am gettting a few now. 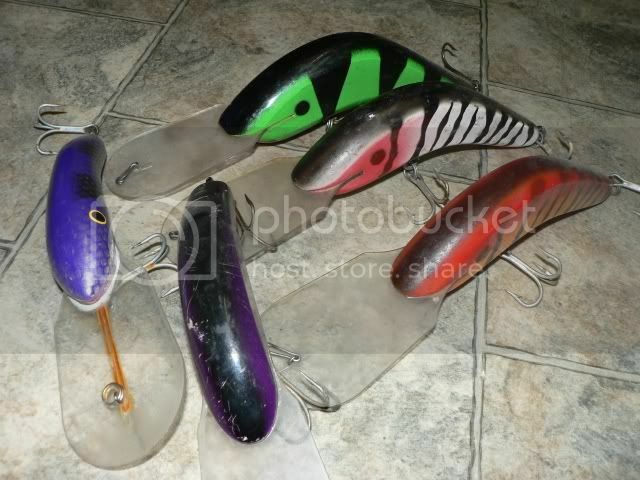 Great lures these , you certainly know they are on the end of a line, by the thumping action in the rod. Here's a pic of my few. Are they the 3 different sizes? I found this one is someones tackle box on the weekend. Nice collection buddy ,forgive the dust but i pulled them off the shed wall ,heres a few 185 mm ,and a couple of 150mm one a big fish taker and the other one of his prototypes with wire in the bib they were trialing , i trolled it up where they were fishing in SA ,i have a few older 150 hanging around .